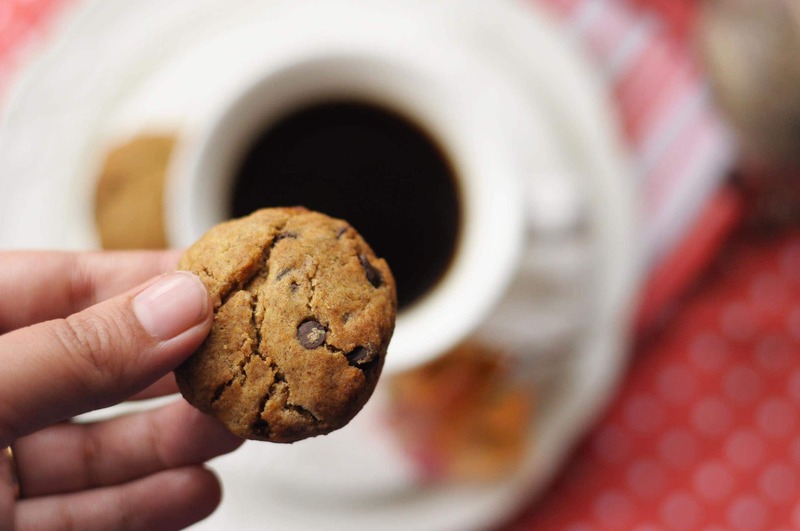 My search for healthy snacks led me to this recipe of Ragi Chocolate Chip Cookies. I ordered a few “healthy & Nutritious” snacks online and let’s just say it was a giant disappointment! When I placed the order I expected a box of ragi cookies but what I received was two cookies dipped in chocolate. It definitely tasted good and it was labeled as healthy so even though I wasn’t happy with the quantity I was okay with it overall….Till I read the ingredients and deciphered the percentages. It did have ragi but it had a higher amount of refined flour and refined sugar so I don’t know why it was tagged as “healthy”.It’s become a gimmick to add one of two healthy sounding ingredients, make the cookies look rather rustic and call them good for you.Read more about millets and how they compare with wheat and rice on my how to introduce Millets in our diets. That’s when I decided to make my own Ragi Chocolate Chip Cookies .I adapted Sanjeev Kapoor’s ragi biscuit recipe with some changes and I really loved them. These cookies were my life savior along with my Healthy Oat & Raisin Cookies and Healthy Buckwheat Cookies.I recently travelled with baby V alone for the first time to Pune and in the whole packing and running to catch the flight I forgot to eat breakfast and these cookies literally saved me a ton of agony, I would have been in for skipping breakfast. These also were the first thing I ate when I came back home after a week and they tasted better than they did fresh.The moral here being that you can store these Ragi Chocolate Chip Cookies for at least 10 days(tried and tested!). I halved the sugar and replaced it with jaggery or raw sugar. This recipe can be easily tweaked to suit babies and kids. These cookies are different from normal high gluten cookies- They need to be treated differently. First– do refrigerate the cookie dough for at-least 30 minutes in the fridge. Second– They do not spread as much, but rise quite a bit.So its important to shape the cookies accordingly.Make these cookies small and flat.Do not scoop them using a scooper like a traditional cookie but make small balls and flatten them on the baking sheet. This recipe can be used as a basic Ragi cookie Recipe.You can add nuts(powdered nuts when giving to babies or toddlers), raisins or some spices- like cinnamon and Fennel. I also have a Double Chocolate Chip Ragi Cookie on the blog.They are a tad bit more decadent cause of a double dose of chocolate but as healthy as these Ragi Cookies. Combine the flours,baking powder and sugar. Add vanilla essence to this mixture. Rub & pinch the butter into the flour mixture.Use your fingers and thumb and rub the butter and flour in between your fingers so that the butter and flour starts to clump toghether. Continue doing so till the butter is almost incorporated coarsely into the flour.It should look clumpy. Add milk and chocolate chips knead the butter-flour mixture.Do not over knead but just combine everything together. Cover in cling wrap or in a bowl with a lid.Keep in the fridge for at least 30 minutes. Take golf ball sized dough into your hands, form a ball, flatten with your palm and place on the baking tray. Bake at preheated oven for 12 minutes* at 180 degrees C.
if the dough isn't coming together, which can happen because Ragi is gluten free and non sticky, add a little more whole wheat flour and a few drops more of milk so that the dough comes together better. For a normal amount of sweetness- Add 1/2 Cup Jaggery ; if you like it a little less sweet- try 1/4 cup of jaggery. Baking time is for small sized flat cookies. Here are some other healthy cookies for you to try too! Nice recipe. Looks yummy and healthy too. Would love to try the same and will give the feedback of same. thank you! hope you like it..
what is the temperature for baking? How much of milk is required? should the mixture be crumbly? Just enough to bring everything toghether..add 1 tbsp at a time..ideally you shouldn’t need more than 2 tbsp..the mixture should be put together enough to make balls. Thank u. At what degree should the cookies be baked? I realise I haven’t mentioned it in the post! My mistake..bake it at 180 degree..if you have a small oven then at 170 degree..